What is an RRSP ? What is an RRSP is a common Canadian question, even for those who make contributions to them. Many of us know we should contribute to one but often do not fully understand why and what are the benefits. If you are wondering what is an RRSP, let me explain. Registered Retirement Savings Plans is a federal government run program that encourages retirement savings and investment by providing generous tax relief. Money put into an the plans is referred to as a RRSP Contribution, these contributions go into special tax sheltered accounts where any income the money generates is not taxed and the contributions themselves are immediately deductible from the contributors taxable income. The accounts themselves are no different then non-tax sheltered accounts, can range from simple bank savings accounts to self-directed RRSP, and everything in between, the only difference being registered accounts are administered and taxed differently. There are a number of tax relief components to RRSP's. The first is immediate and what people generally notice the most. Every dollar contributed to a RRSP is deductible at the contributors marginal tax rate. Let's assume your marginal tax rate is 25% and you contribute $10,000, you will receive a refund of $2,500 on that $10,000 on your next tax return as long as you have the contribution room, make the contribution before the deadline, and chose to take the deduction. Another tax relief component is the long term tax deferal that RRSP's offer. Lets take that $10,000 contributed above. You decide to invest it in a medium risk bond mutual fund. Over the last 10 years this bond has provided on average 9.25% return, and you expect that rate to continue until you retire in 15 years. 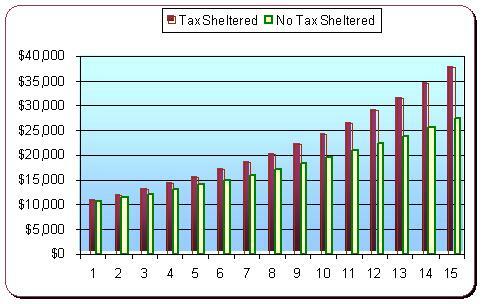 The chart below tells a visual story, comparing sheltered and non-sheltered amounts over those 15 years. At retirement, the tax sheltered money will have a balance over $10,000 higher than the non tax sheltered money. And that's if you don't invest another cent over the 15 years. If you add more money to the plan, you get more immediate tax relief with the contribution and also more tax deferral while the money is in the plan. An RRSP can also provide typical retiree's with a permanent tax savings. Those who earn less in retirement than when they worked will usually fall into a lower tax bracket after they leave work. Assume the 15 years are over and you just retired. I am now going to draw on that $10,000 I invested year ago. In case you were not aware, this RRSP withdrawal is taxable. But, the good new is as I am making less money now my marginal tax rate has dropped to 20% from 25%. So, when you take the money out you only have to pay 20% tax, a permanent savings of 5% or $500. As you can see RRSP's are have many benefits and should be the foundation of retirement and personal tax plan and plans.